It’s July, and I am joining Hoagies Gifted in the blog carnival devoted to the topics of giftedness. This month’ topic is summer reading and I want to share some of the favorite books of my 7 year old – books about gifted children. 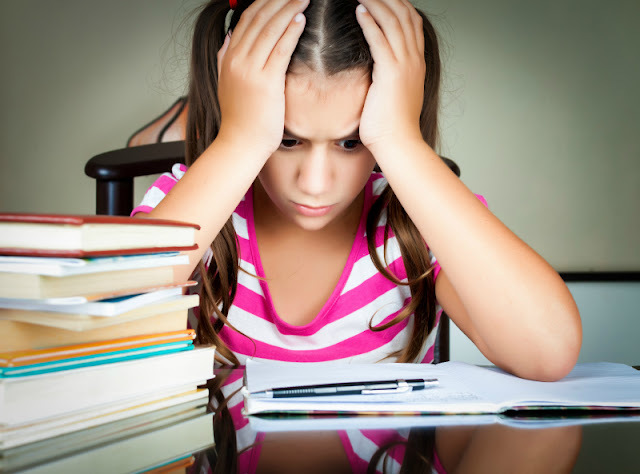 Do gifted children read differently? Most of those that I know personally are truly voracious readers, but they are intrigued by very different topics. One of Smarty’s best friends reads every book set in Star Wars universe, another one is not interested in fiction at all, but devours books about programming in Java and website design. Smarty, on the other hand, continues on her “I hate non-fiction” trail at the moment and reads almost exclusively fiction and comics. She defines her current reading interests as children like me who go on adventures and, apparently, she keeps developing their adventures further in her head. When you have a child who is 7 but reads at the 11th grade level, picking appropriate books can be a big challenge. In some cases one of us reads her books before (my husband is a big fan of fantasy while I prefer science fiction), but sometimes we actually read some of her books later, since she was so enchanted by them. Here are 6 series about gifted children that really fascinated her this spring and summer. The Genius Files is a newer series by Dan Gutman. Currently 4 books are out, and one more is expected soon. I only read the first book while Smarty read all four and found them hilarious. Frankly, I think Dan Gutman could have done much better with his initial premise, and I found the story line ridiculous. However, the action develops on a road trip across the USA, so the book manages to slip in some interesting facts, especially about bizarre museums and roadside attractions. The main characters are 12 years old, and one of them has a photographic memory and attention for detail while his twin sister is extremely good at puzzles. Overall, it’s my least favorite from the list, but Smarty is eagerly waiting for the next installment in this series. Strictly speaking, The Boy Who Ran for President (also by Dan Gutman) is not a series, since there is only one sequel to the first book. Still, I decided to include it as a much more interesting example of this writer’s imagination and a different example of giftedness for the main character who is extremely charming and socially adept. Just like in the first set of books, adults are mostly clueless and/or incompetent – something that you might want to consider while deciding whether to introduce these books to your children. I had multiple conversations with Smarty about both series helping her to sort out the truth and the fantasy in them. I am glad that the older series Encyclopedia Brown by Donald J. Sobol was republished recently. Smarty’s school has a big collection of these books, and Smarty keeps taking them from her school library or from our city library and rereads her favorites. The stories are more like mental puzzles solved by a very talented young detective who loves to read and remembers everything he read. Some of the stories feel like a big stretch over the body of the puzzle itself, but it’s the series and the character that are probably closest to the “real world” out of all 6 suggestions that I share here. The Mysterious Benedict Society by Trenton Lee Stewart has a brilliant premise and a good execution to go with it. A team of kids (two boys and two girls) are selected through a series of ingenious tests to be spies in a special school run by an evil mastermind. One has to suspend disbelief from time to time when sci-fi inventions enter the story, but I enjoyed reading the first book, and my daughter swallowed all of them, plus a special book of puzzles with The Mysterious Benedict Society theme. I also really enjoyed strong female characters in this book, especially resourceful Kate, presence of responsible (and irresponsible) adults, and very intelligent humor. I highly recommend this series to your young readers. My husband, a fantasy fan, stumbled upon the first book from Percy Jackson and the Olympians series by Rick Riordan by accident. We both really liked the series and the consistent fantasy universe created by Rick Riordan. Smarty had an intense interest in Greek Mythology since she was about 5, and we thought that she would enjoy the series despite some very intense battle scenes happening pretty much in every book. We were right. Last summer was her Percy Jackson summer (she was 6 then), and since then she reread her favorite parts many times and could practically tell them by heart. I am impressed with the way Rick Riordan brought Greek Gods and heroes to life in the 21st century. I also really like the fact that he included multicultural characters in his second set of books about Percy Jackson – his key characters have Native American, Chinese, Latino, and African American heritage. The characters start their book life at the age of about 12 and become young adults through the series. They all have special supernatural gifts from their godly parents, but they are also smart, resourceful, brave, and supportive of each other – great qualities that we all want to see in our children. And here comes our family favorite, the best book ever (in Smarty’s words) – Harry Potter by J.K. Rowling. We tried to hold out on Harry Potter for as long as we could. My husband thought that maybe Smarty will stop reading once the books get darker. She didn’t and she is now finishing the series for the first time. I expect that she will be rereading her favorite parts (we own these books both as hard covers and as Kindle books) all summer long, just as she did with Percy Jackson last summer. Even though Harry Potter and his friends also have gifts from the fantasy realm, the characters feel very real to me, and I am very happy that we have another Potterhead joining the ranks of Harry Potter lovers. I hope that Smarty will reread the books when she is older and will be able to understand subtle details then (she was able to tell which boy Hermione likes only in book #5). We need help and advice in finding the next series that daughter will connect to. Which books about kids with special abilities did your children enjoy? Has she read the Little Women series? Emma is really into those books right now. Great suggestions for appropriate books for gifted children. My boys have enjoyed reading the Harry Potter book series. They were part of a Book Club for other gifted children who also wanted to read all about Harry and his adventures. Initially, I stopped by to read your post for the blog hop hosted by Hoagie’s Gifted. As far as ideas for other book series, has your daughter read the Black Stallion series? Or another fun series for summer that my boys enjoyed when they were younger is The Spiderwick Chronicles. Hope that you will also visit my blog to read my Hoagie's Gifted - Summer Reading post about Summer Reading Nooks. Can't wait to check out your Pinterest boards! I am on Pinterest as well. Recently, we finished reading The Evolution of Calpurnia Tate and we both loved it. Our oldest is enamored with the Lord of the Rings series. She also really enjoyed Little House and Narnia. We're looking at maybe Terry Brooks for her...she seems to like fantasy. My boys are currently in the Percy Jackson series, and before that my oldest really liked the Nerds series. My husband just recently finished reading LOTR outloud to them. Harry Potter is a favorite, and Lemony Snicket and Gregor is too. I keep trying to convince my kids to read The Mysterious Benedict Society!! There's a few on your list I haven't heard of, gonna go look them up, Thanks! George's Key to the Universe is also very good! Smarty would like Spiderwick Chronicles, but she'll devour the books in a day. Diane Duane has the Young Wizards series, which start off with "So You Want to be a Wizard" and builds from there. You need to read those books in order, but Chrestomanci you don't. I've heard Redwall books are great, but haven't read them yet. I'd also suggest the Lloyd Alexander books, I really enjoyed the Prydain series as a kid, but then expanded into the whole rest of the series. She might also like the Black Stallion books, but those are only of interest to huge horse fans. If she does like horses I'd suggest the Marguerite Henry books to read. I read those over and over and over again. Continuing her earlier love of mysteries, you could go with the Nancy Drew and Hardy Boys books, those are old classics my boys are getting into. And I will stop my novel now. Not a series, but my son loved Eddie Red Undercover. It's about a boy with a photographic memory. You should try C.S. Lewis' The Lion, the Witch, and the Wardrobe series. A great fantasy series! I highly recommend The Cruisers -3 book series by Walter Dean Myers. The books tell about life in a fictitious school for the gifted from the perspective of African American gifted students. See my Mirror Books Facebook page for more books for culturally diverse gifted students. The series that begins with "The Lemonade War" is focused on two siblings-a younger, GT, grade-skipped girl who is great at math, but sometimes struggles a bit on the social side, and her socially astute brother who struggles a bit academically (at the start of the series, the siblings find out they'll be in the same class in the fall due to the younger's acceleration). It's really well done. My son is 8 and at about a 10th-11th grade level at last test. Finding appropriate books have always been a challenge. He's read the Percy Jackson series, the Kane Chronicles, and Heroes of Olympus. All are great. Another great trilogy that my son has read and enjoyed is the Hero's Guide trilogy. Also, my son loves How to Train Your Dragon series and the Guardian's of Ga'Hoole series. Have you checked out the Artemis Fowl series. It's not new, but the A Wrinkle In Time series is classic. My son adored it.